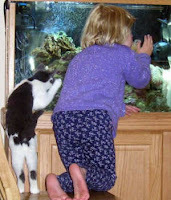 Cat in People: Felinesophy: Learning Behavior: who’s imitating who? Learning Behavior: who’s imitating who? 4# Have You Ever Wonder? More than 15 years ago, I participated in a personal development course by a well-known Indonesian writer and motivator, La Rose. There was an interesting explanation from her presentation at that time about learning behavior. She explained that from our childhood, we learn how to behave, response, gesture, and body language from our surroundings. In most cases, from our parents and family. All the characters we have as a grown up person or adult are derived from many years where we adopt most habitual from our family. She called this process as learning behavior. Do you ever notice how members in one family have the same typical gestures when smiling or being grumpy? Or, even in responding to horrible news. Needless to say when we are having animals as our companions at home. Based on my observation, cats are the perfect creature in learning other cat and our behavior and responses. If it’s not, then why the terminology of copycat is ever exist? Feline are excellent impersonator because they are keen observer. They always notice and study how their beloved humans behave and react. My own experience has shown these hypotheses are for real. For instance, when one of my cat eagerly want to get out from a closed room, he knows how to open the door by jumping off many times towards the doorknob and manage to push down it by his paws, boom alakazam… and the door is open. I was so amazed because I never taught him how to open the door. Or, in another occasion, my other cat open the window by pushing all her body against it and place her paws on the window knob….after putting hard work and extra efforts, she finally succeeded unlock the window. Once again, I never coach her how to do it. So, if no one in my home ever trains my cats how to do those things, where they get the idea? Believe it or not! For another prove, see below how a marvelous feline plays piano. One other thing that makes me stun is the resemblance of our cat temperament or personality with their owner. Thus, are my close watching over catlovers, and of course including my own. My long time colleague has a cat, which its body is robust and describes my friend’s body type. They have similarities in personality, being rather snob, nasty and put privacy matter as priority. For other facts as examples, the list could be way too long if I put them all together here. As catlover, how about yours? And, for non catlover, have you ever notice this one? On the other paws, ooopss… I mean on the other hand, in humans world, we found the term with “cat” word as a phrase to indicate we do adopt and behave like cats. I have mentioned in my earlier posting about catfight and catwalk. The term of copycat is the most captivating phrase. Even among cats, I often see cats do imitating each other and not just copy our characters. Based on those “cat” terms we used, we are being impersonator to cats’ behavior. Hence, I often wonder to myself, actually who’s imitating who? Moki would love for you to do Reiki healing for him. Mommy is fairly familar with it. Years ago when she was just out of high school, she went to school to study massage therapy. She specialized in alot of different eastern techniques and touched base with Reiki but only slightly. Thanks so much for offering to do this for us! What an interesting post. Cats certainly do imitate us, and they also learn by imitation. I had a cat who used to jump at the doorknob too, but she never quite figured out how to get it open. I had another one who would open the bathroom door by throwing herself against it. I don't know how she figured out she could pop it open by doing that. I also don't know how a 7-pound cat could generate enough force to do it. But she did, usually when I was sitting in there! She trained me to just take her in the bathroom with me. Smart cat. Good post. Thank you. We could learn lots from our pets. I was attracted the most by your question "Have You Ever Wonder?" Wow ... wonder - yes, I would like to wonder. Unfortunately, it is impossible to learn wonder. The ability to wonder is like a faith - we either have it or not - that's the gift, but not our earning. The above explains and our animal love. We can either talk wisely or to love. Comments may clear lots of things, but the best explanations are impotent to create the simplest touch of love. Thank you once more for the good article. Yes, I would have to agree that we cats are very keen observers. But I think it is often the humans who take on our characteristics, you are the copycats because that is the closest to cat you can be :) For instance, when you see us sleeping in the middle of the day, don't you think, "man I wish I could take a nap now?!" Hello! I'm fine! Everything went well. Beanies have been taking good care of me! thanks for checking in! My beans and i appreciate your kind words! Wow, what a fabulous post! Lots if interesting things to think about. We Ballicai certainly resemble our Mom and Dad in many ways -- in a way, I'm a lot like Mom, but in other ways, Dorydoo is much like Mom! And Daddy is so much like our big Alpha Cat Brainball that it's really funny... but then my little brother MaoMao is like Daddy in other ways. It's great to meet you! You have a lovely and thoughtful blog. I took your advice and changed the template again. Stop by when you get a chance and let me know what you think of the newest one! I love the YouTube video!!! That's why our humans love us so much. It is a wonderful bond. Lifelong.